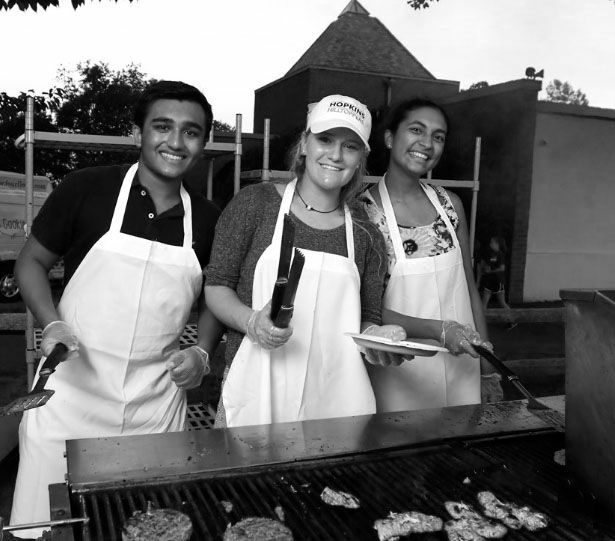 Deepak Gupta '18, Jessica D'Errico '18 and Sanea Bhagwagar '17 enjoyed grilling hotdogs, hamburgers, and chicken for hungry teachers and students before the band performances. The annual Back to School Bash, run by the Hopkins Student Council, was held on Friday, September 23 on The Hill.The Bash is a time for students to get together with friends and hang out stress free before the school year ramps up in terms of homework. The day of the Bash, the Varsity Football team had a home game against Emmet O’Brien Tech. They played well defensively, bringing home a strong win of 24-7. There was a large home crowd for the team, as it was the night of the Bash, which helped cheer them on. At this year’s Back to School Bash Student Council ran a grill where students and faculty could purchase hamburgers, hot dogs, drinks, and more. The money that was made went towards supporting Student Council’s budget. Philip Ross ’17, this year’s Student Council President, said “I wanted to make the burgers affordable for students,” and made sure to price them that way. In addition to the grill, Student Council had the Four Flours Baking Company cookie truck come to the hill for the night. The company makes all-natural, handmade baked goods such as cookies, brownies and ice cream sandwiches. Audrey Braun ’19 said, “I always love it when the cookie truck comes to Hopkins. The cookies are delicious!” The company’s flagship store is local, just down the hill on Chapel Street in downtown New Haven. Back to School Bash was a fun, relaxed atmosphere for students to sit back and relax for a night. Student Council provided food, several people provided entertainment, and the students provided the conversation.